NieR: Automata hit its one-year anniversary and is one of the best gaming experiences to come out of last year. In fact, the game won our own Game of the Year award through a hard fought battle with other great games of 2017. 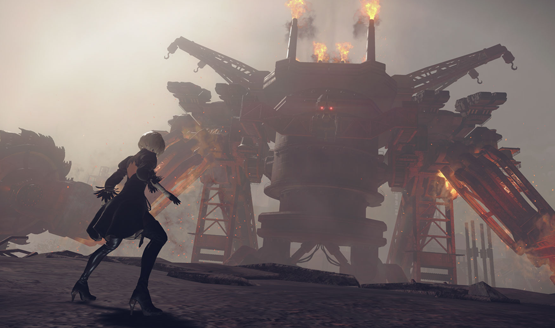 To celebrate its first birthday, the PlayStation Blog highlighted a few things you may not know about the NieR franchise. With as intricate and deep as the game itself is, you can expect there to be some twists and turns ahead. Don’t worry, this list is largely spoiler-free if you have yet to play the game, but if you want to go in completely blind, turn away now. At the end of PlayStation 2’s Drakengard, many people believed the final ending was a joke, transporting the main character and final boss from their own fantasy world to modern-day Tokyo for an intricate and ultimate showdown (would you expect anything less?). Once the original NieR released, it became apparent that Drakengard’s final ending gave birth to the NieR universe. The Drakengard characters brought the fatal disease that our world, setting up for the events of NieR and NieR: Automata. When NieR was originally released in Japan, it had a slightly different protagonist. In that version, Nier is Yonah’s brother, doing his best to help cure his sister’s illness. The game was titled NieR:Replicant. The Western marketing team decided that s story about a fatherly figure would be received better outside of Japan, so the development team got back to work and changed the game. NieR:Gestalt was released with a fully redesigned Nier, now Yonah’s father instead. 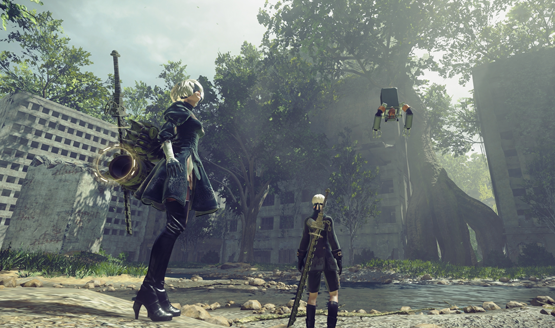 NieR: Automata is its own game, and doesn’t require knowledge of the first one to enjoy, however, there are numerous Easter eggs and bits of lore that connect the two games. The Iron Pipe–the first weapon you get in NieR’s prologue, can be obtained when fishing in the waters of NieR: Automata’s world. Simple Easter egg, or crucial story clue? If there was a single theme to attribute to NieR, it would be existentialism (though the games dive into plenty outside of that simplified mantle). The developers named many of the characters into this deep game after the very deepest minds that posit their own thoughts and theories on existence. Names like Blaise Pascal, Simone de Beauvoir, Jean-Paul Sartre, Karl Marx, Friedrich Engels, and others appear as NPCs in the game. No, the trophies aren’t microtransactions, but you can grind out the in-game currency to unlock various trophies without actually completing the trophy requirements themselves. We reported on this last year when NieR: Automata first released, and conversations surrounding the feature were mixed. The first NieR had enemies called Shades that had a very distinct and unintelligible way of speaking. In NieR: Automata’s second route, you will unlock a voice-changer that affects the voice ranges of 2B, 9S and A2. Head to [Settings] > [Other] to find the slider. Crank it up fully if you want the characters to sound like an old 56K modem, or tune it to its lowest setting to make them grunt oddly just like the Shades from the first NieR. The Death Rattle chip serves only a single purpose: hacking machines will make them emit an odd death cry when they are defeated. It might take up an entire slot and have no other real use, but that’s just par for the course when it comes to some of the bizarre elements NieR employs. It might be in the DLC, but it doesn’t make the fight any less NieR. In fact, the battle against these two may be more NieR than the entire rest of the game, with unique music, visuals, and attack patterns that take things beyond anything you’ve seen in NieR before. This Easter egg appears only under very specific circumstances, so many players may have missed it, but this boss awaits you in the forest after meeting the requirements. At first it looks just like Godzilla, but when the fight starts and the machine begins shooting purple lasers, there’s a very obvious callback to Hideaki Anno’s 2016 movie Shin Godzilla. Don’t forget that there is at least one more major secret that players have yet to find in NieR: Automata, at least publicly, though Yoko Taro is sure that if it was found, it would have been publicized long before now. It was also announced that NieR: Automata reached 2.5 million in sales, an impressive number for a relatively niche game. What are some of your (relatively spoiler-free) NieR: Automata Easter eggs? Share your thoughts on the game with us in the comments below.